Slightly larger than a normal corona. Its flavors grow with good food and it is a magnificent conversationalist. The elegance of this cigar lies in its precise construction and its defined aromas of grilled nuts, liquorice and new leather. This cigar has a size of its own. Longer than a traditional Corona, but with the same ring diameter, the Siglo III is very much a classical Havana, only without the headiness. The intense nature of this cigar at a young age will mellow with time. The Siglo III has an incredible regular draw and looks stunning to the eye. 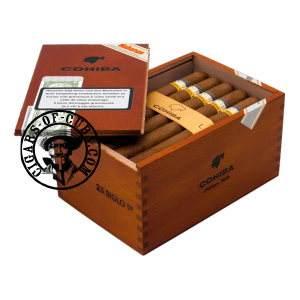 A medium bodied Havana that delivers a smooth oily smoke, with hints of nutmeg and cinnamon on the palate. The second third is woody and will offer some gentle spicy notes. Notes of sea salt and a smooth woody taste. It has a very pleasant, calm, rich and oily finale. It reminds me of the taste of sea food and 'Provençal gastronomy'.